On my travels through out the west I have come across several “cow camps”. 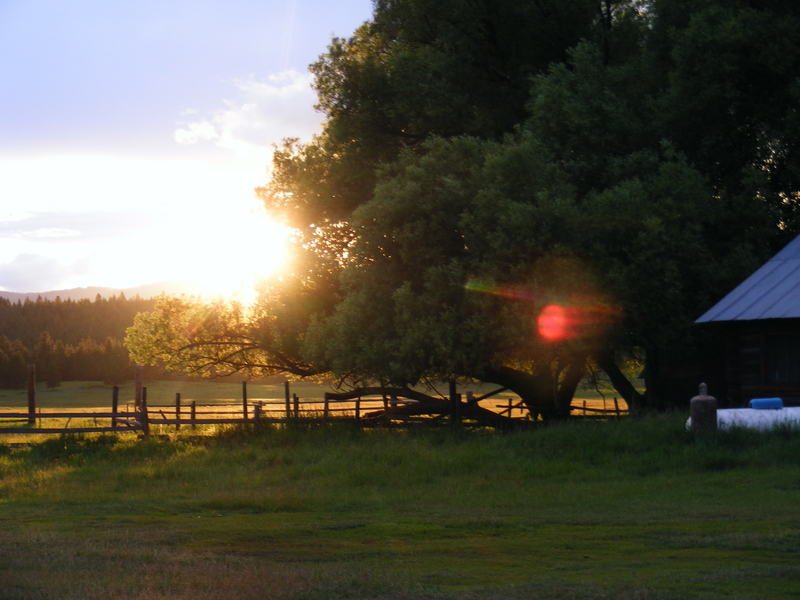 “Well just what is a cow camp”, you might ask, “a place for cows to camp over night?” “Are the cows fed hay and grain and given a bed to rest in?” Well not exactly….When I first started long riding I did not even know there was such a thing as a “cow camp”!! 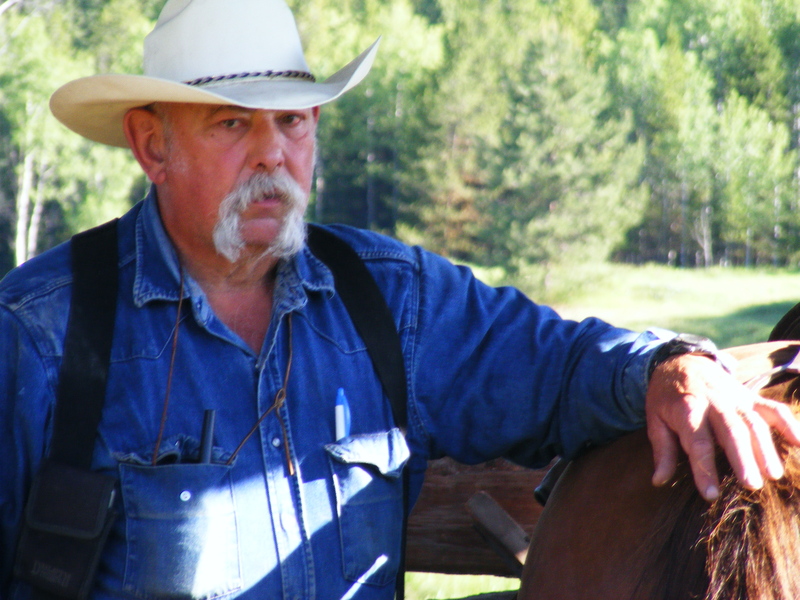 I have come across many over the years each different each the same, it’s a temporary home for the cowboys and cowgirls that manage the herds of cattle that roam the National Forest land or BLM land or large private ranches. Some of the camps are a trailer and a corral. Others are old shacks patched together. Some are merely tents and steel corrals. It was raining hard when a white pickup stopped, I’d seen it go by on the road a couple of times already. I knew it must be a local rancher. Cow dog on the seat, fencing equipment in the back of the truck. A weathered face poked out the window, “hey if you need a place to hold up we got a cow camp up a ways”. Well, I thought a second…. I was heading home, only had another few days to go. I wasn’t going to bother them but I knew one thing for sure I was hungry!!!! and I also knew another sure thing and that was that cow camps have food!!! Food kept running thru my mind. The cowboy was headed for town and had to get going. We parted ways with a “maybe”. The warm rain, now coming down strong was determined to get me wet. I rode on a ways and finally chose a thick, tall fur tree to take cover under and waited it out. It did not take me long to decide when I reached the the turn off leading up to the cow camp. I headed up the road like a horse heading for home, now wet and hungry. No one was there when I rode into camp, “just make your self at home” were the instructions so I did. It was one of the prettiest places I have ever ridden into. Jerome Yoder and Toj Fletcher were the two cowboys managing the herd for a ranch out of Hot Springs, Montana. 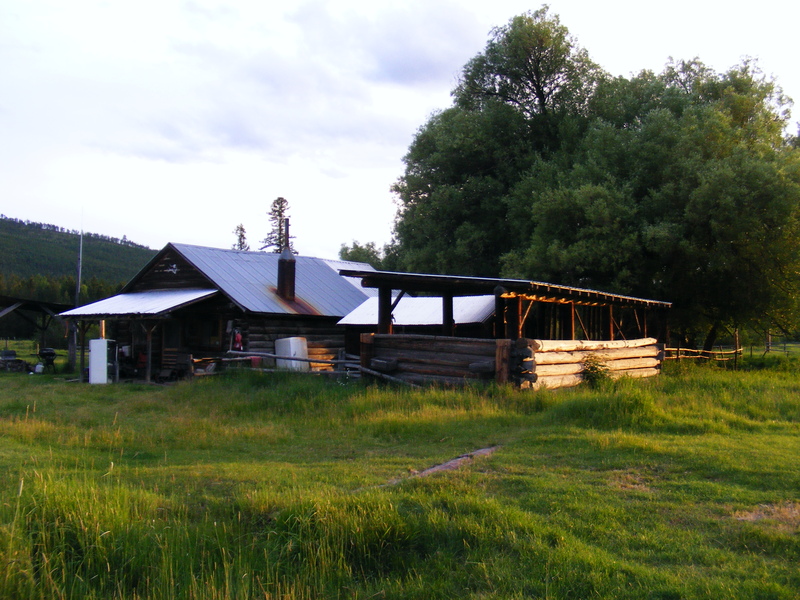 They had been at this mountain cow camp with the cattle for about a month and would stay until late October. What a pretty place it was. 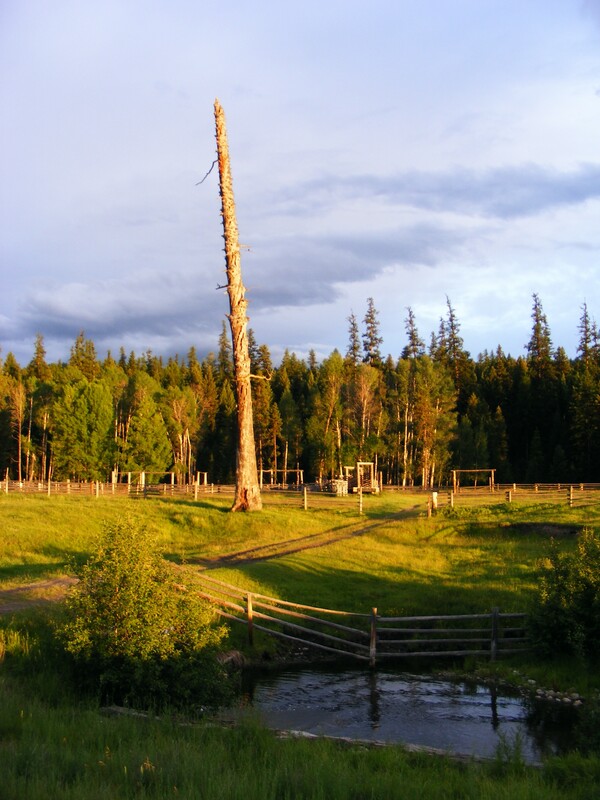 Neither men knew much about the history of the place but obviously it had been a homesteader ranch. 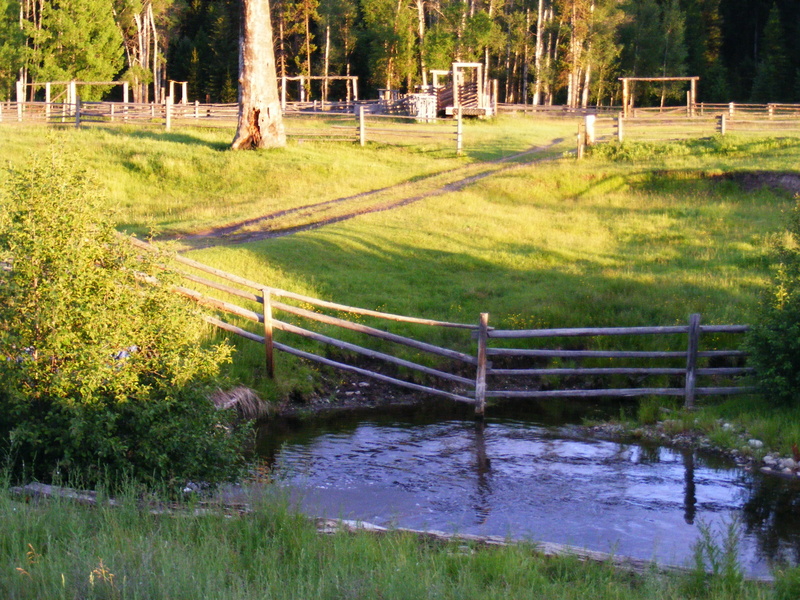 High mountains surrounding a year around creek running thru natural, open luscious meadows. Abundant wild life. Long cold winters, deep snow and plenty of wind. The two men came in late, tired and dirty. 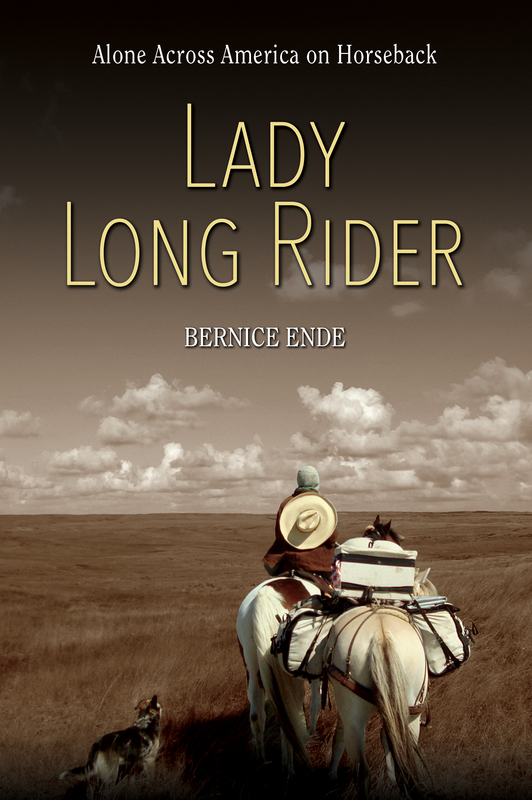 Toj had been out with cattle all day and his horse knew the routine as it waited to have the saddle taken off, then sweet grain poured out for her, a brush down, then back into the pasture. The cowboys alternate the horses, riding one day rest 2 days before using that same horse again. 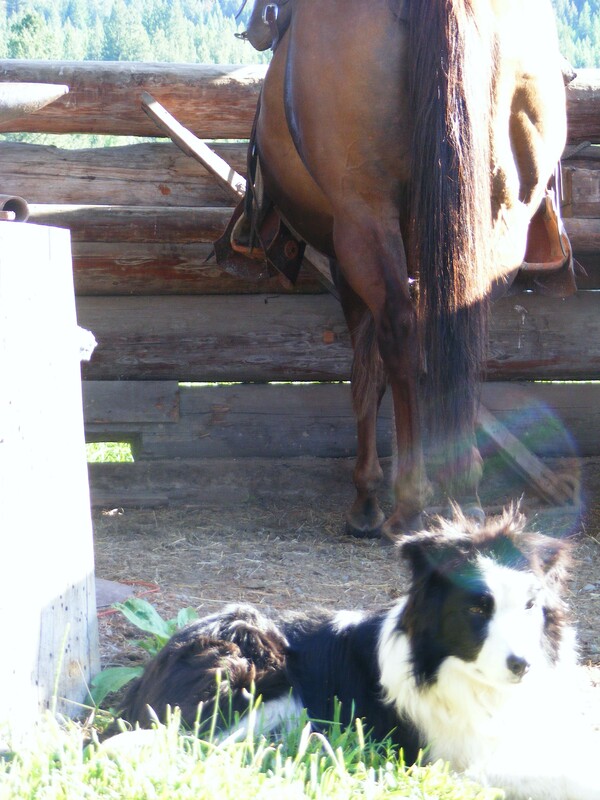 A good cow horse, one that is quick minded and agile is a pleasure to ride and greatly appreciated by any cowboy. They are generally treated very well. Rained hard again the night I arrived. I am not much for sleeping inside anymore but when you get wet, coming in is not so bad. In the morning everyone was up early and Jerome had a feast in the making. OH I do I laugh now when I think of sitting there smelling that food and drinking his “cowboy coffee”, its just boiled coffee most of the time. It is not espresso or anything but a deeply satisfying cup of coffee. I never know if it’s just the surroundings when I am drinking a cup of “cowboy coffee” or if its the people I am sharing the brew with or that I am usually just so darn hungry and a cup of hot coffee or hot tea tastes so very good. They both must of thought, “damn that gal sure can eat”. But it could not have been to bad because they said, “stay as long as you like”. 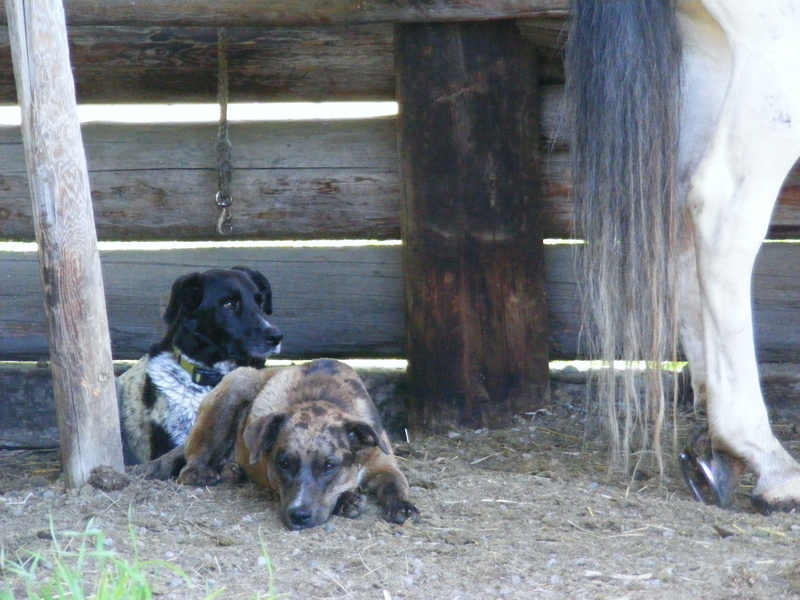 My girls, Essie and Spirit were in full agreement when it was suggested that I ride out with Toj to help with the fencing and bring in some cows that had gotten out on Wolf Creek road. Jerome had to work on the horse trailer and run into town. So I was given a horse to ride and out we rode. The job these two men have is this…keep the cattle alive!! They must in doing so keep fences fixed, keep the cattle off the roads, move them to different locations to keep from overgrazing or damaging creeks, take out salt for the cattle, treated hurt animals. They do this 7 days a week from morning until dark. 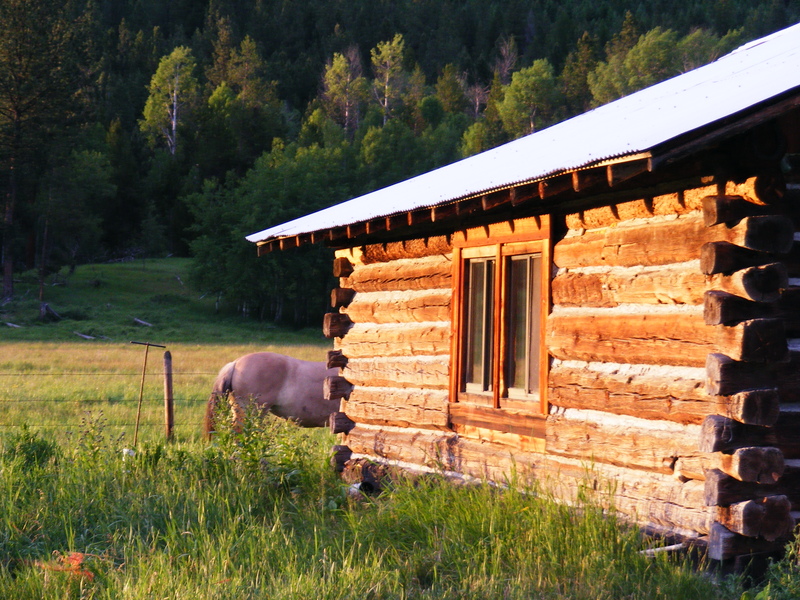 They are usually given food from the ranch or ranches that own the cattle. 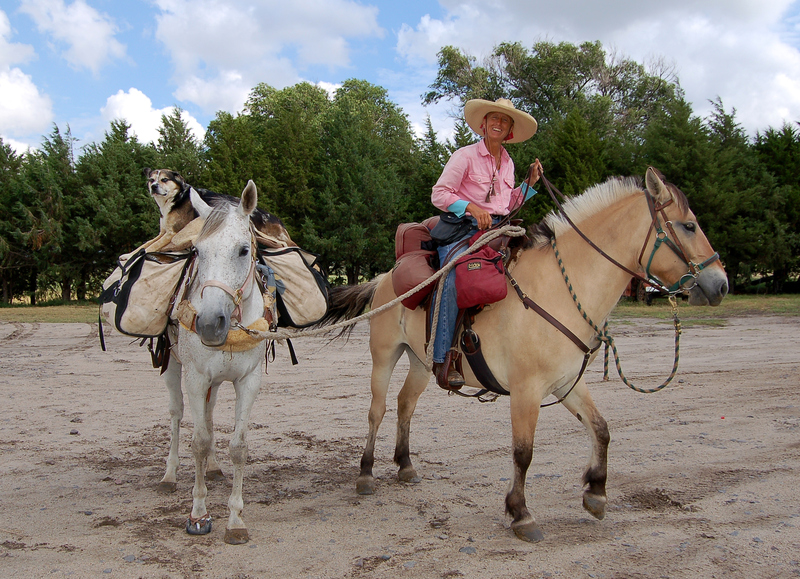 Most times the horses (anywhere from 3 to 5 horses per rider) that the cowboys use and the dogs belong to the cowboys. 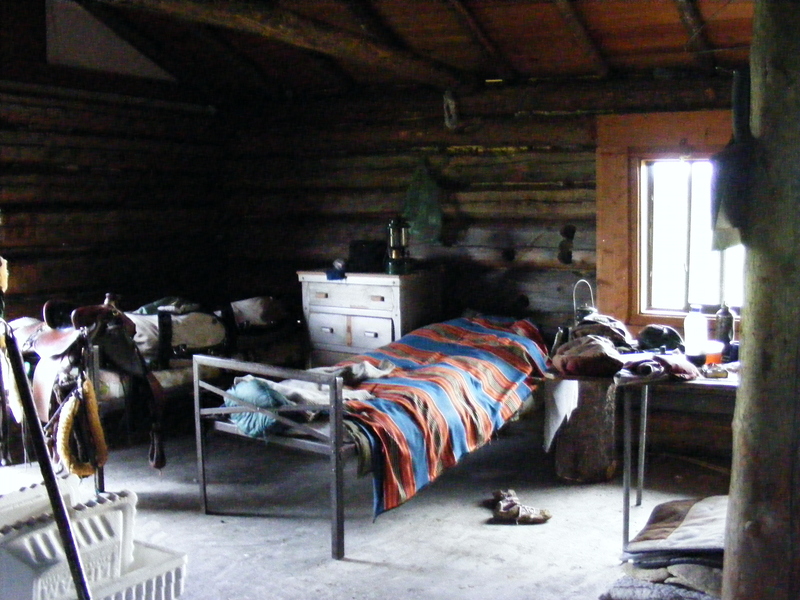 Most camps do not have electricity. 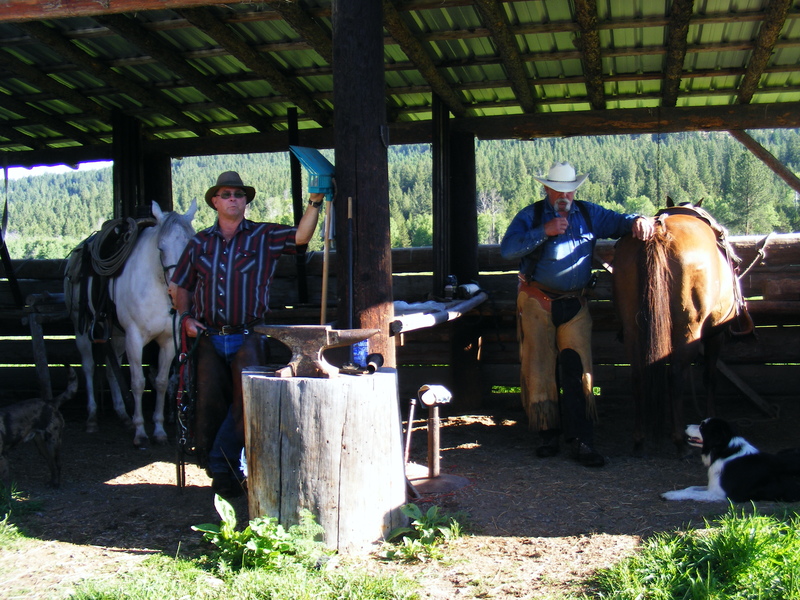 The cowboys do their own horseshoeing, cooking, cleaning. They both said, “I love this life”. 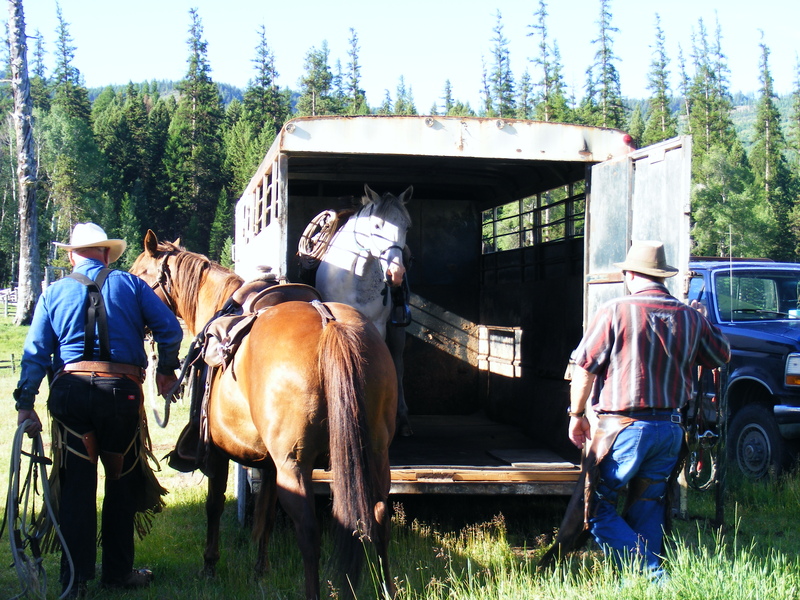 These cattle were trailered out to fatten over the summer months on National Forest Service land. These are cow /calf pairs and were the Black Angus breed. In October or maybe later the cow and calf are separated and the calf will either be held over one more year or are sold and shipped off to feed lot. It is not often that I get to ride a cow horse. Dash was her name,Quarter horse breed. She was a beautiful sorrel mare 8 years old I think. To ride a fast, quick horse that will go anywhere for you just to get those darn cows is like driving a sports car. These horses seem to like the chase. Like the dogs the work these horses do is matter of agility, speed and quick thinking with a sturdiness of mind. I rode out that morning with a full belly but I rode back in hungry. 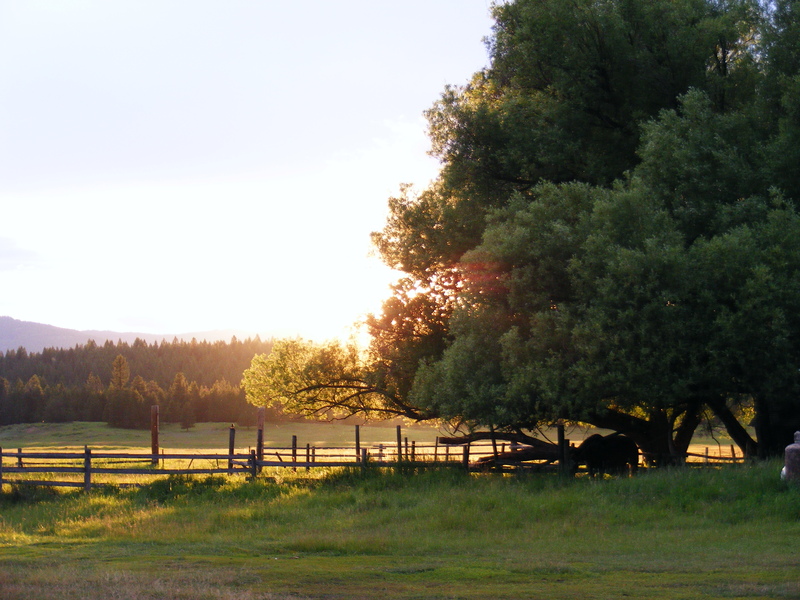 We fixed fences, moved cattle, which means you are running a horse over rough country, dashing under trees at a fast gallop to head off a cow and her calf who have a different route in mind than you do. I think we left about 8am and got back in by 7pm. Can’t say I was exhausted, long riding is pretty tough I was in condition from the 600 miles I’d just ridden. Jerome made another feast! Geez I was hungry! Chicken,salad, potatoes( I made those with garlic). Slept outside that night. The mice and pack rats had kept me up the night before. It’s not unusual for me to share my space with “varmints” but usually I have Claire dog with me and she keeps them from running over my face…Now that would cause me to scream. I spread my tarp out and made a bed out in the open meadow near the bunk house. The moon was coming full, horses grazing in hobbles nearby, the steady biting and chewing lulled me to sleep, I could not have asked for a more satisfying day.